Liberal Democrat councillors on Bury Council were able to secure all-Party support last week for a proposal to introduce ‘Clear Air Zones’ around all of our local schools. In many parts of Bury, particularly near to our main roads, busy junctions and our high number of motorways, there are areas of poor air quality and that pollutants in the air can exceed safe limits. Air pollution has a massive impact on people’s health with the young and other people with increased health risk like many elderly eople being most at risk. There have been statistics that show that in Bury the impact of poor air pollution equates to approximately 950 years of life lost per year. There is no single answer, and no easy answer to tackling air pollution. In Greater Manchester there are starting to be efforts to tackle congestion and more needs to be done such as removing the most polluting buses from our streets. Other issues are dependent on Government action and we would have concern that the Government’s current timescales are woefully unambitious. The Liberal Democrat proposal is to create enforceable ‘no-idling’ zones around schools, so that people do not wait outside a school with a car engines running. Lib Dem Councillor Steve Wright said: “This is a simple action that can be taken is to make enforceable ‘no-idling zones’ outside all of our schools. It never ceases to amaze me how many parents are waiting to collet their children (or grandchildren) leaving their engines running which is just about the worst thing you could do. As a second step we would also like to extend this to play areas and outside hospitals and health centres and to work with our local NHS providers to do this. 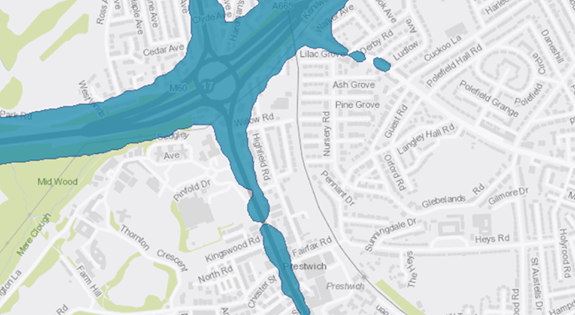 This map shows areas of high pollution around the M60 and A56 in Prestwich/Whitefield. This is a worthwhile objective although I would like to know the location of all the air quality monitoring locations from which the figures are collected. However pollution has been worsened by Bury Council’s numerous traffic calming road humps which result in vehicles slowing and then accelerating, thus polluting more. Pollution has also been worsened by Bury Council’s road “improvements” on Bury New Road, through Prestwich village where traffic is in an almost permanent state of traffic jam throughout the working day. A noble sentiment and ambition, but as you say, there are too many selfish, idle collectors who just sit outside schools (often on the zigzag lines) with engines running. Good Luck – but will require a lot more than education – it will require enforcement – and presumably there is no budget for that! ‘re.engines idling outside schools. I think this is a really good idea. Taxi drivers are some of the worst offenders. Ice cream vans also but as they probably need to leave their engines running perhaps they should be made to park further away. How will this be enforced.